Don’t believe me? Deeply knead your own calves, or have someone do it for you. Or, deeply knead (if they’ll even let you for more than a few seconds) someone else’s calves, and pay close attention to the resultant reactions. I’ve not met anyone whose calves are as loose and aligned as was intended in an aligned functional structure. Tight calves are not just a localized problem, as described above, and do indeed create other serious problems of misalignment, stress, and pain as the rest of the body struggles to compensate for the stress created in the lower legs. No matter the athletic activity, the calf stretch block (adjustable incline board) will become one of your new best friends. Correct use of this Adjustable Calf-Stretch Block will also stretch the plantar muscles on the bottom of your feet. Used in conjunction with the other Fix Your Feet Tools you’ll find on my website, you’ll never have to worry about what seems to be an epidemic among athletes these days: plantar fasciaitis; a condition where the muscles and fascia on the bottom of the foot is too short and begins to tear during workout. Plantar Fasciaitis can be a debilitating recurring problem if left untreated or if treated ineffectively. As usual, western medicine attempts to treat the symptoms complained about instead of looking for the cause of physical problems, requiring drugs, physical therapy, and surgeries which are more often than not, uncalled for, and actually wind up causing even more problems. The calf muscles you’re aware of in your lower leg cross the ankle joint and attach to various places on the 26 bones of each foot. When those muscles become shortened, tight, and dense they yank and pull the foot bones and 3 arches every which way, creating all manner of foot problems. This is a pretty obvious, logical, mechanical anatomical Truth, yet I wonder how many “foot doctors” show any concern about the condition of the patient’s calf muscles? And even if they did, the common recourse would be surgery! ; something which then would create even more structural problems as a result of the “cure”. Regular and correct usage of the Adjustable Calf-Stretch Block(adjustable Incline Board) will create a dynamic shift throughout your entire musculature and positively affect your skeleton alignment. You will notice your posture change for the better and your movement will become more fluid and easy. Referring to the above-mentioned test to determine the condition of your calf muscles, the more soreness, pain, denseness, and tension you find in your calves the more you’ll know you can benefit from this Self-Maintenance Tool. 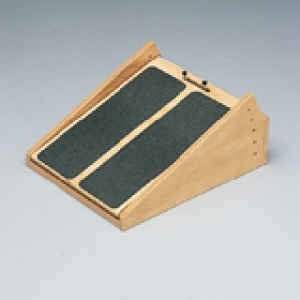 The Adjustable Calf-Stretch Block (adjustable Incline Board) can be used alone to great advantage, and when used with other relevant tools become even more effective. 14 x 18" with non-slip tread. Adjusts to 5 levels: 5˚-10˚-15˚-20˚-25˚ elevation adjustment. Flat shipping fee of $22. Please allow 1 to 2 weeks for delivery.